Original, fully 100% guaranteed letters written and signed by Tolkien, as well as books with Tolkien's signature. John Ronald Reuel (JRR) Tolkien, author of The Hobbit and The Lord of the Rings, was born in <?xml:namespace prefix = "st1" ns = "urn:schemas-microsoft-com:office:smarttags" />Bloemfontein, Republic of the Orange Free State (OFS) on 3 January 1892. Little is known about his first three years in the OFS, except that his father was already the Manager of the Bank of Africa in Bloemfontein when his wife-to-be, Mabel Suffield, relocated from Birmingham (UK) to South Africa in 1891. Upon arrival in Cape Town, they married on 16 April 1891 in Cape Town Cathedral in British Colonial Cape of Good Hope. After marriage they settled in Bloemfontein, with AR Tolkien resuming his duties as Manager of the Bank of Africa. 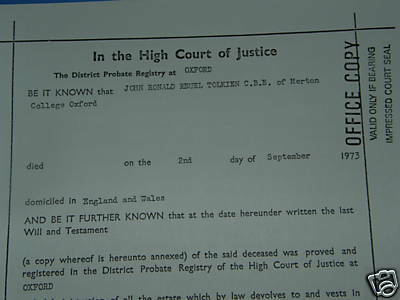 Even though Arthur Tolkien moved to South Africa around 1890, this item proves that he was already the Manager of the Bank of Africa in Bloemfontein as early as 12 February 1891. Arthur signed this post card as AR Tolkien, Manager. 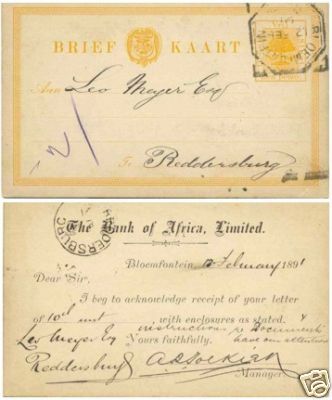 The post card is of the first type (HG1) of the Orange Free State and was sent by the Bank of Africa from the General Post Office shown in this item. Postmarked BLOEMFONTEIN, 12 FE 91: No. 22 of Putzel, but without time code. Arrival strike REDDERSBURG, FE ?, 1891 catalogued as Postmark No. 2 of Putzel & Visser (no time code).